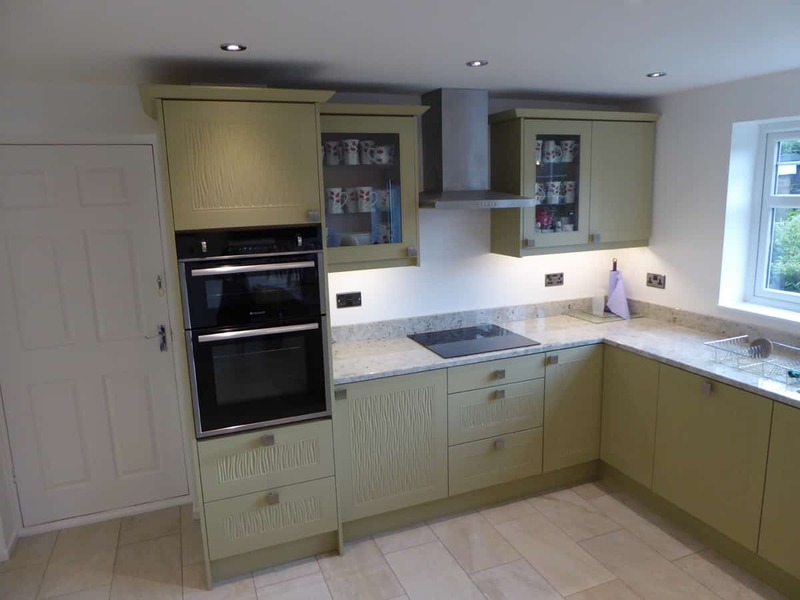 Patterson Kitchen in Middlesbrough – The Brief? 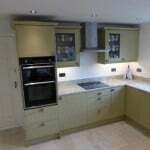 To find a company to design and install a new open-plan kitchen with minimal disruption to our daily life. 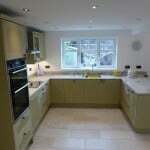 Work was required to be completed in a tight timescale. After consulting with Michael, the designer, and explaining what we wish to achieve we left the planning in his capable hands. 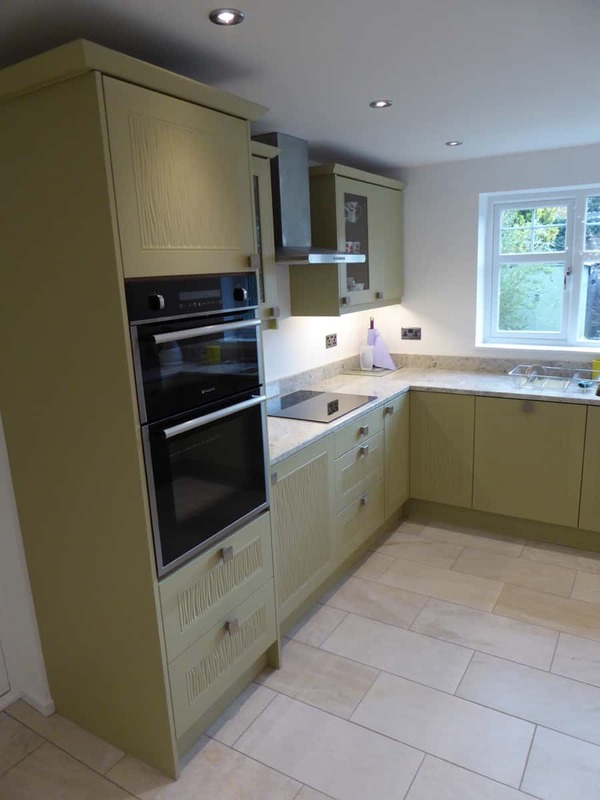 A 5 bedroom detached house the property is located in Middlesbrough. 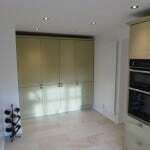 The kitchen was dark with space that could be utilised more efficiently. 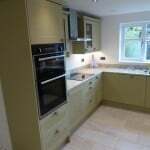 The project involved extensive building work, removal of a wall, window and door. We then finished the walls and ceilings with plaster and paint. 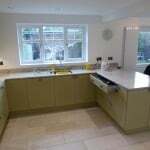 We wanted a kitchen that would be lighter, with more storage space, and an island. Due to insufficient width in the layout, an island wasn’t feasible so we left it to Michael to design a similar feature that would create the same effect. More than happy with the result; it’s amazing and perfect to prepare meals. 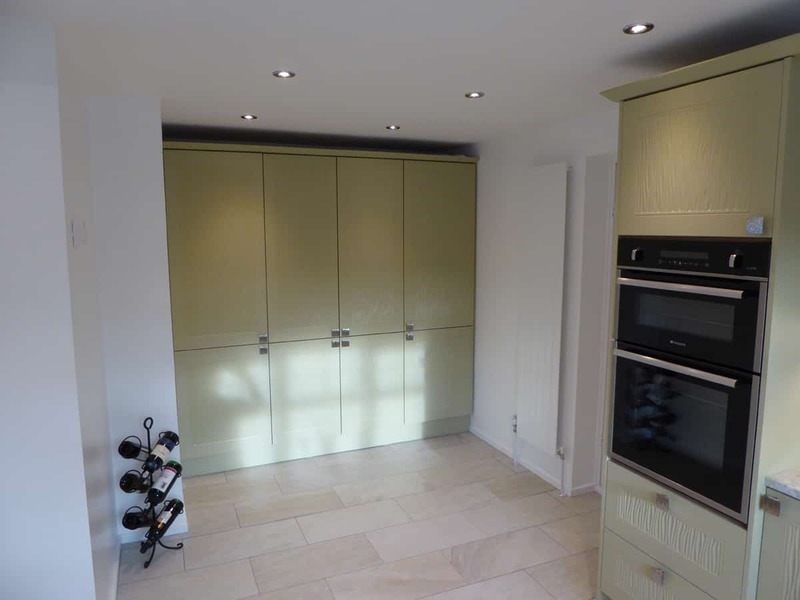 LED ceiling lights make the kitchen really bright, the work tops and floor tiles which Michael helped us choose go perfectly with the sage green cupboards. 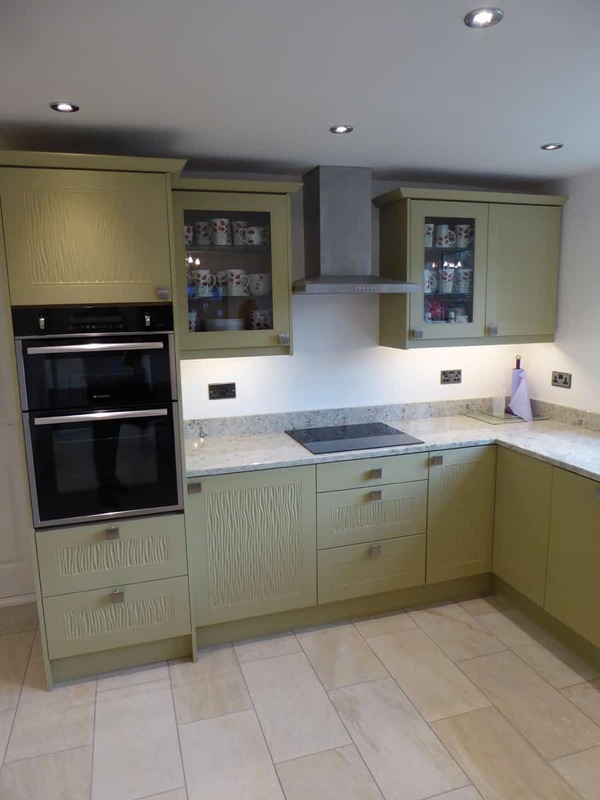 Previously we gave had light oak, medium oak and limed oak kitchens, so the sage green is a complete transformation and makes the kitchen light. Initially the housing oven unit didn’t conceal a gas pipe on the floor but the kitchen fitters were able to move it and cover the pipe. 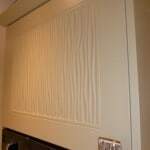 Another larger cupboard had to be relocated to fit the space, along with a wider cupboard ordered and installed to line up against the extractor fan. 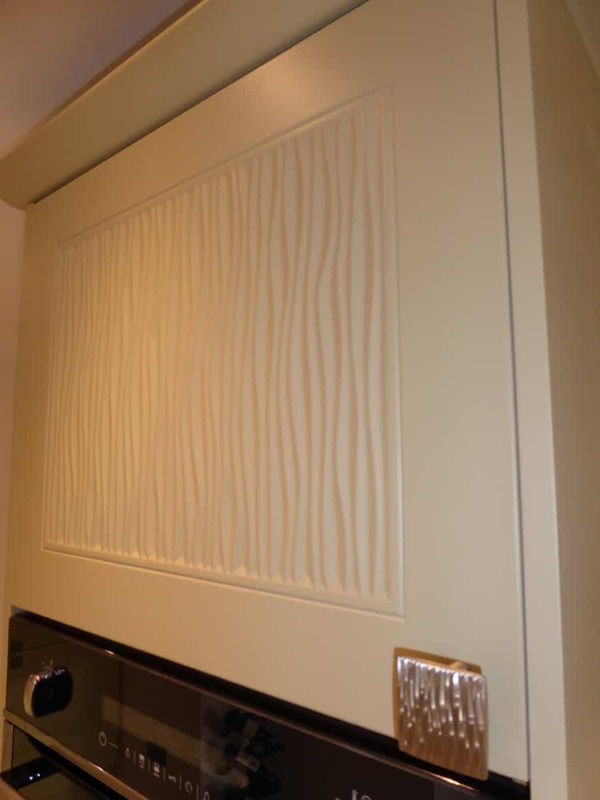 We love the wall units, it’s so easy to find things and the deep drawers are amazing for storing electronic appliances in such as the blender and electric grill, keeping the work surfaces clear and tidy. 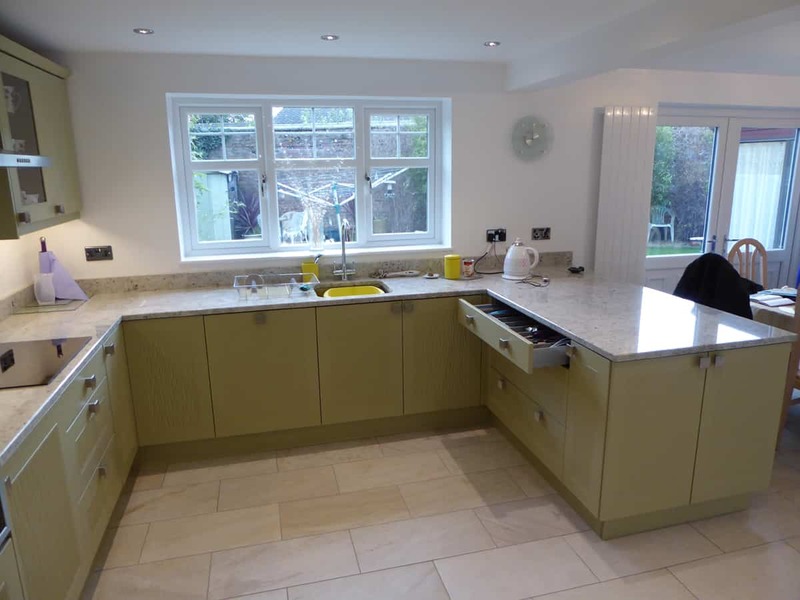 Additionally, we feel that the overall style of the kitchen is unique, sophisticated and classy – something we love! 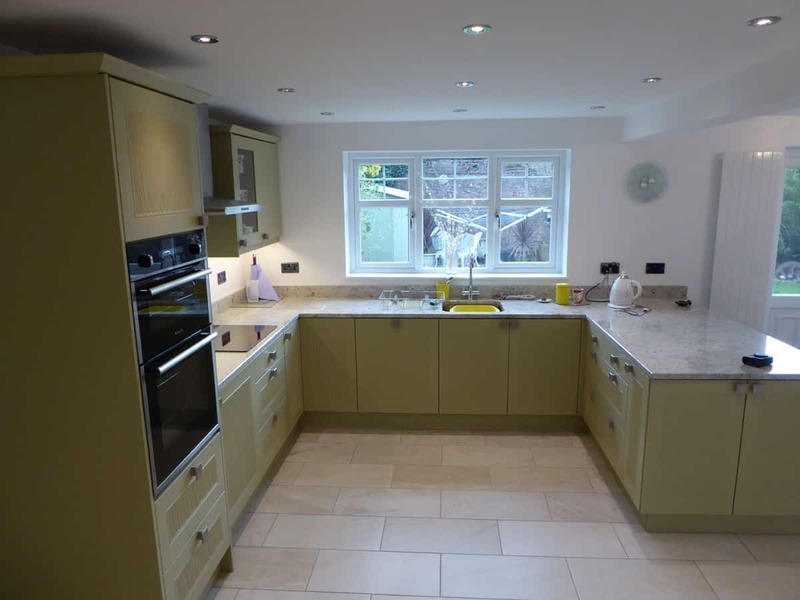 We chose Court Homemakers because we wanted a kitchen with a ‘WOW factor’. 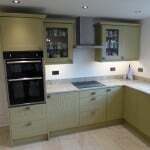 The units we chose are exclusive to Court Homemakers. These were totally different from anything we had seen in other showrooms. Additionally, we chose Court Homemakers because of their excellent reputation for quality and design.